Directed by Brian De Palma and starring Tom Cruise, 1996’s Mission: Impossible was a critical and commercial success. Based on the 1960s CBS television series, the adaptation became the third highest-grossing film of that year, bested only by Twister and Independence Day. Five movies and two decades later, the Mission: Impossible franchise shows no signs of slowing. The latest installment, Christopher McQuarrie‘s Mission: Impossible – Rogue Nation, is an action-packed spy thriller that’s bolder than Bond and more fun than Furious 7. IMF operative Ethan Hunt (Cruise) is on the hunt for the Syndicate, an impenetrable group of renegade spies and assassins intent on destabilizing the global economy and the very foundations of civilization. Back in Washington, the Impossible Mission Force faces total disbandment by CIA chief Alan Hunley (Alec Baldwin), who believes their reckless behavior is a threat to national security. On the run from the CIA and the Syndicate, Hunt gathers his team – Luther (Ving Rhames), Brandt (Jeremy Renner), and Benji (Simon Pegg) – and joins forces with Ilsa Faust (Rebecca Ferguson), a disavowed British agent with ties to Syndicate mastermind Solomon Lane (Sean Harris). From Vienna to Casablanca, Rogue Nation is a globe-trotting espionage actioner with gripping imagery from cinematographer Robert Elswit (Inherent Vice, Nightcrawler) and excellent performances from the best ensemble since De Palma’s original film. Sean Harris (Prometheus) excels as a creepy Simon Pegg doppelgänger, while Rebecca Ferguson (Hercules, The White Queen) steals the show as the Black Widow-esque Ilsa Faust. It’s incredible to consider that the 53-year-old Tom Cruise is still performing death-defying stunts for these films, and yet that’s what absolutely sets the M:I series apart from contemporaries like Bond, Bourne, and The Fast and the Furious franchise. Mission: Impossible – Rogue Nation begins with Cruise running to catch a plane – a massive military Airbus A400M to be exact. We’ve seen the Risky Business star scale mountain peaks and jump off the world’s tallest tower (the Burj Khalifa in Dubai), but Rogue Nation‘s opening sequence is without a doubt the most jaw-dropping stunt we’ve seen from Cruise so far. As the plane soars 5,000 feet into the air, Cruise grabs onto the side hatch and goes for a ride. Of course, Cruise is discreetly harnessed to the door, but the wind pressure was so intense that the actor had to wear special contact lenses so he could keep his eyes open for the scene. This dedication to credibility is what keeps moviegoers invested in the old-fashioned spy series. Director Christopher McQuarrie (Jack Reacher) elevates the proceedings with an operatic, Hitchcockian sensibility that raises the stakes and creates nail-biting tension. During a scene in the Vienna State Opera house, the director effortlessly builds suspense as Hunt traverses the 150-year-old opera house to prevent the assassination of an Austrian chancellor. Faust is there too, holed up in a part of the stage scenery, watching Hunt through the scope of a sniper rifle as the Syndicate’s hit-men swarm the catwalks above the stage. It’s a masterful exercise in big-budget Hollywood filmmaking, and one of the most memorable scenes of the summer. 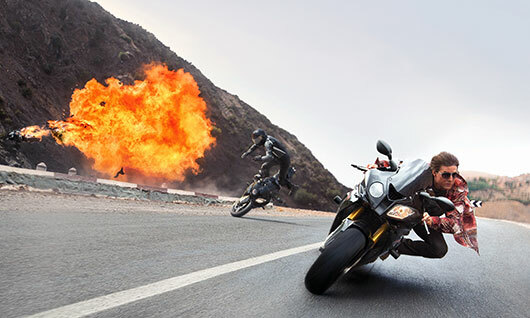 Mission: Impossible – Rogue Nation is an expertly crafted spectacle with great performances, exhilarating set pieces, and a balanced blend of comedy and suspense. For a series of films about impossible missions, the real impossibility is that these movies keep getting better and better. At this rate, Mission: Impossible 6 will feature Cruise space-jumping into a sarlacc pit with an armful of lit fireworks. I’m totally there.